Thank you to Kraft Heinz for sponsoring this post. All opinions expressed here are my own. 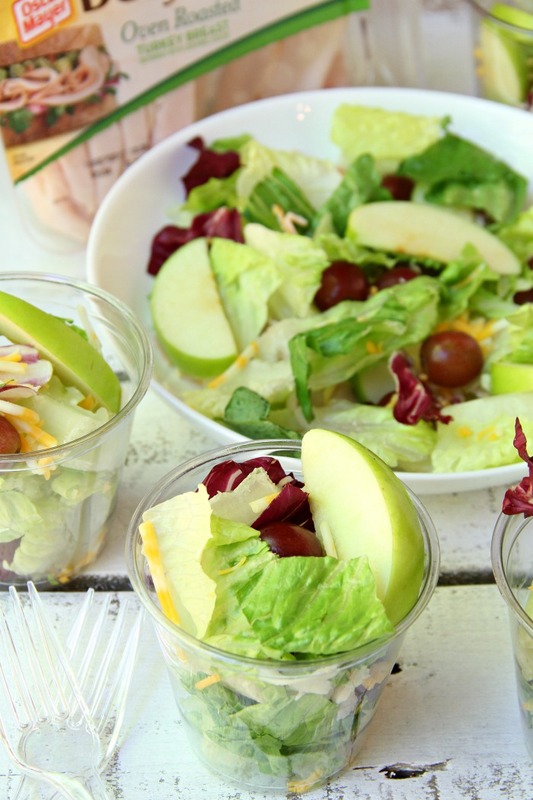 Harvest Salad to Go – A delicious combination of granny smith apples, grapes, cheese, bacon bits and more make this a perfect addition to any party menu! Serve in cups for easy and convenient eating! The kids will be back to school in no time at all but we’re holding onto the last days of summer around here. We’re spending Labor Day weekend up at the lake and it’s always a bit of a bittersweet time. Although we’re nearing the end of summer, football season is right around the corner and in our family, that’s a big deal. Our parties will continue long after Labor Day with plenty of homegating and entertaining on Sundays. On Labor Day and game day, our menu usually consists of burgers, hotdogs and chicken wings. Alongside the main course, I like to serve a fresh salad. The Harvest Salad recipe I'm sharing today is perfect for parties. . .and tailgating or homegating, too! 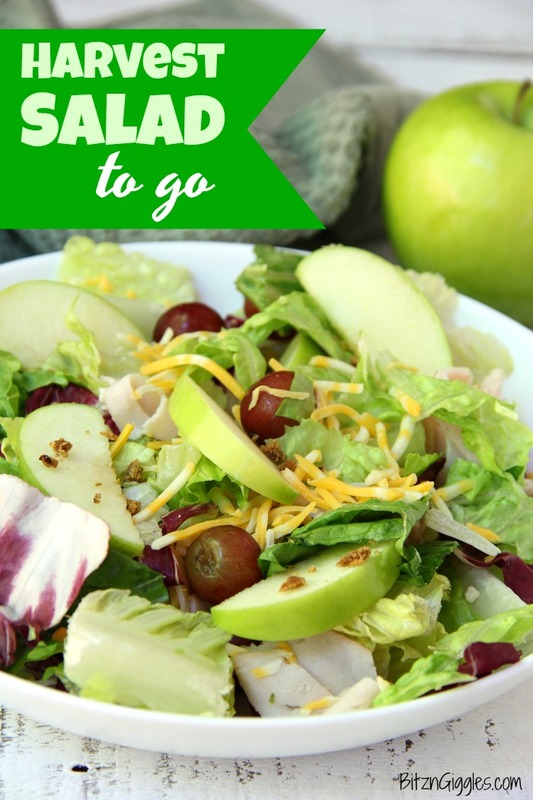 It's a delicious combination of granny smith apples, grapes, cheese, turkey and bacon on fresh, mixed greens. My favorite dressing to toss it with is ranch, but a balsamic vinaigrette is just as tasty. So why is this called Harvest Salad to Go? Here's why. . . 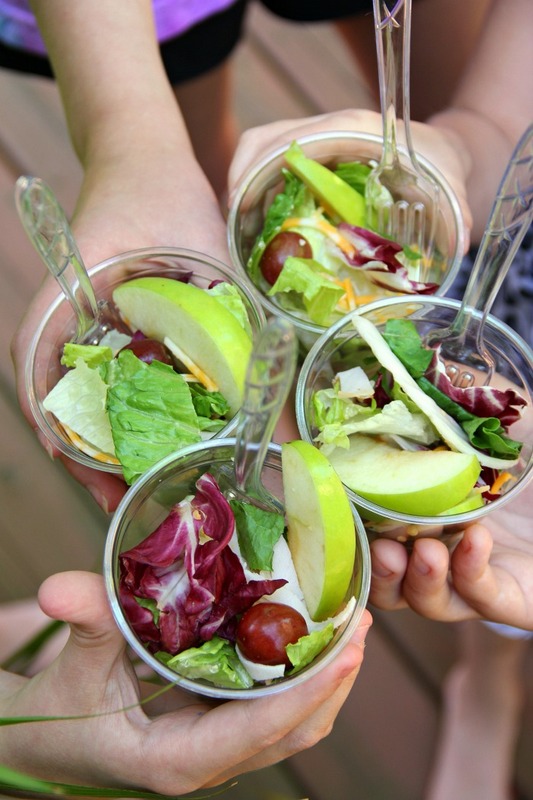 When entertaining, my favorite way to serve the salad is in little cups. There's something magical about pre-portioned sides in little cups. 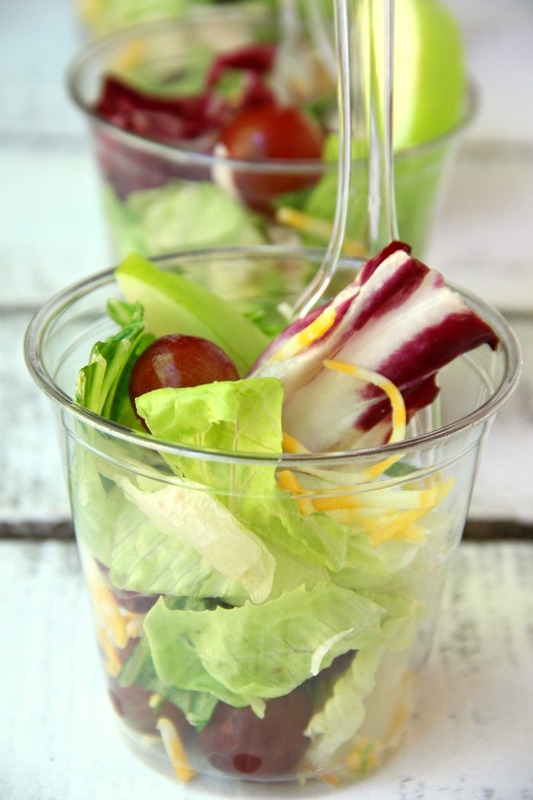 EVERYONE wants to try this salad in a cup - even the kids. It's so easy and convenient. The kids love to grab one to go, and the adults like to munch on them while cheering on the team. I don't know what it is about kids, but in my experience they like to pick out and eat the fruit in the salad first and then they go in for the rest of it. Hey, whatever works. This salad is one of my favorites because I usually have all of the ingredients right in my fridge and it's easy to throw together. There's really nothing in this salad that even picky eaters wouldn't like. My favorite ingredient has to be the granny smith apples. 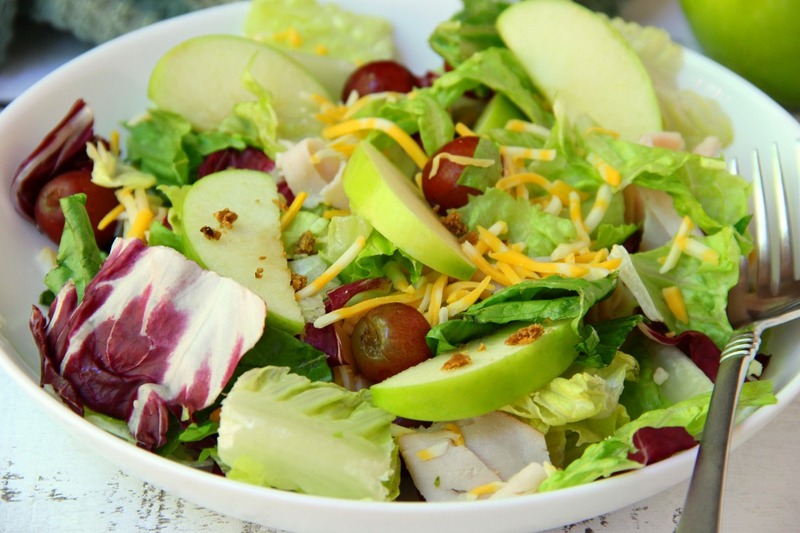 It gives the salad a bit of tartness and I love the crisp crunch it adds. Grab a cup and let's get to celebrating. Here's to the end of a fantastic summer and the beginning of fall and football season. Get all of your Labor Day and game day needs at Walmart and for more tailgate-ready recipes, visit GrabGoWow.com. 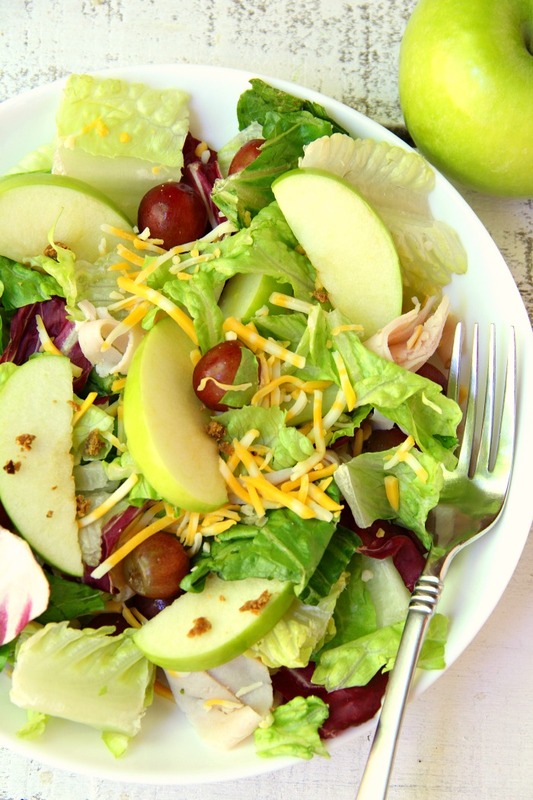 A delicious combination of granny smith apples, grapes, cheese, bacon bits and more make this a perfect addition to any party menu! Serve in cups for easy and convenient eating! 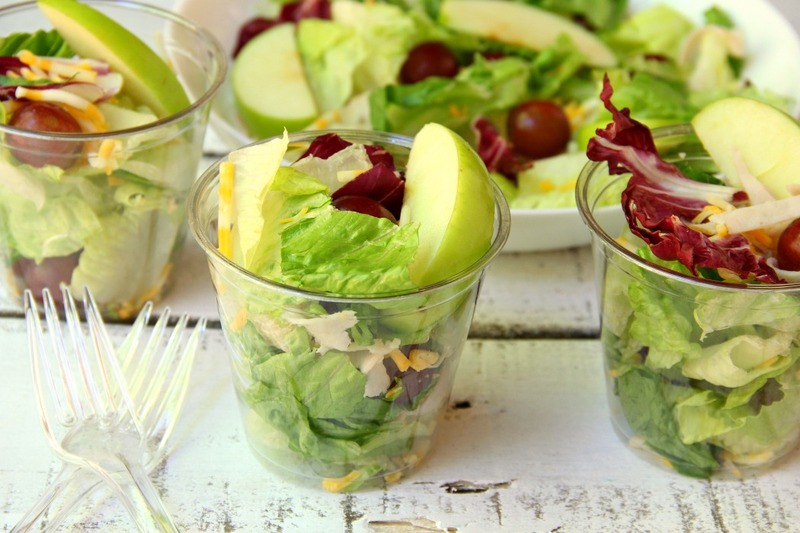 Serve salad in individual cups for easy and convenient eating!